Buddy Wayne is the father of “Nightmare” Ken Wayne.. NOTE: This is not the same Buddy Wayne who worked in the Northwest in Portland and Vancouver..
May 21, 1976 – NWA St. Louis: Hubert Gallant defeated Buddy Wayne. June 25, 1979 – CWA: Tommy Gilbert & Tommy Gilbert Jr. defeated Buddy Wayne & Ken Wayne. 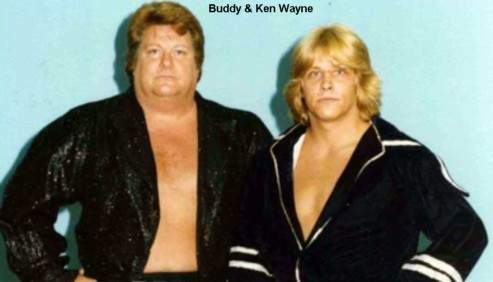 July 2, 1979 – CWA: Buddy Wayne & Ken Wayne defeated Tommy Gilbert & Tommy Gilbert Jr..
July 9, 1979 – CWA: Tommy Gilbert & Tommy Gilbert Jr. defeated Buddy Wayne & Ken Wayne by disqualification. July 16, 23, 1979 – CWA: Buddy Wayne defeated Tommy Gilbert. July 30, 1979 – CWA: Tommy Gilbert defeated Buddy Wayne. August 27, 1979 – CWA: Dallas Montgomery & Tommy Gilbert Jr. vs. Buddy Wayne & Ken Wayne ended in a draw. September 3, 1979 – CWA: Steve Regal, Tommy Gilbert & Tommy Gilbert Jr. defeated Buddy Wayne, Danny Davis & Ken Wayne. September 17, 1979 – CWA: Buddy Wayne & Ken Wayne vs. Koko Ware & Roger Howell ended in a draw. October 1, 1979 – CWA: Buddy Wayne & Ken Wayne defeated Hector Guerrero & Roger Howell. October 22, 1979 – CWA: Hector Guerrero & Steve Regal defeated Buddy Wayne & Ken Wayne. October 29, 1979 – CWA: Ricky Morton & Sonny King defeated Buddy Wayne & Ken Wayne. November 5, 1979 – CWA: Koko Ware & Steve Kyle defeated Buddy Wayne & Ken Wayne. December 1, 1979 – CWA: Hector Guerrero, Koko Ware, Larry Hart & Steve Regal defeated Buddy Wayne, Ken Wayne & The Blonde Bombers (Larry Latham & Wayne Ferris). December 22, 1979 – CWA: Ricky Gibson & Robert Gibson defeated Buddy Wayne & The Avenger. December 25, 1979 – CWA: Buddy Wayne defeated Jerry Bryant. January 1-2, 1980 – CWA: Paul Ellering defeated Buddy Wayne. January 3, 1980 – CWA: Red Reese & Ricky Morton defeated Buddy Wayne & Sonny King in Texas Death match. January 4, 1980 – MSW: Buddy Wayne vs. Cuban Assassin ended in a draw. January 7, 1980 – CWA: Buddy Wayne defeated Jerry Barber. January 8, 1980 – CWA: Red Reese defeated Buddy Wayne. January 15, 1980 – CWA: Steve Regal defeated Buddy Wayne. January 22, 1980 – CWA: Paul Ellering defeated Buddy Wayne. January 28, 1980 – CWA: Ricky Gibson & Robert Gibson defeated Buddy Wayne & Sugar Bear Harris. February 17, 1980 – CWA: Ricky Morton & Steve Regal defeated Buddy Wayne & David Oswald. February 23, 25, 1980 – CWA: Ricky Morton defeated Buddy Wayne. March 1, 1980 – CWA: The Gibson Brothers (Ricky Gibson & Robert Gibson) defeated Buddy Wayne & David Oswald. March 2, 1980 – CWA: Ricky Morton & Steve Regal defeated Bub Smith & Buddy Wayne. March 7, 1980 – CWA: Rick Morton defeated Buddy Wayne. March 8, 1980 – CWA: Jimmy Valiant & Steve Regal defeated Buddy Wayne & David Oswald. March 16, 1980 – CWA: Jerry Bryant defeated Buddy Wayne. May 12, 19, 1980 – CWA: Robert Gibson defeated Buddy Wayne. June 16, 1980 – CWA: Carl Fergie & Tony Boyles defeated Buddy Wayne & Gypsy Joe. July 17, 1980 – CWA: Ken Lucas & Rick Morton defeated Buddy Wayne & David Oswald. November 15, 1980 – CWA: Bill Dundee & Jimmy Valiant defeated Buddy Wayne & Larry Latham. November 22, 1980 – CWA: Ken Lucas & Rick Morton defeated Buddy Wayne & David Oswald. November 29, 1980 – CWA: Buddy Wayne was in the vacant Television title battle royal won by Koko Ware. February 2, 1981 – CWA: Eddie Hogan defeated Buddy Wayne. April 13, 1981 – CWA: Sonny King defeated Buddy Wayne. June 1, 1981 – CWA: Sonny King defeated Buddy Wayne. August 1, 1981 – CWA: Jerry Lawler defeated Buddy Wayne by disqualification. August 31, 1981 – CWA: Roy Rogers defeated Buddy Wayne. January 20, 1986 – CWA: Buddy Wayne & The Freedom Fighters (Flash & Justice) defeated Billy Travis, Phil Hickerson & The Spoiler. January 26, 1986 – CWA: Frank Morrell & Phil Hickerson defeated Buddy Wayne & Jim Hellwig.